The EMODnet data infrastructure is being constructed in three major phases and is currently in the 3rd phase of development (2017 - 2020). Building on the EMODnet Bathymetry portal developed during Phase I (2009-2013) & Phase 2 (2013-2017), Phase 3 will see further upgrading of the EMODnet Digital Terrain Models (DTM), including incorporation of more surveys and further improvement of the digital bathymetry. Satellite Derived Bathymetry (SDB) data will be included to cover gaps in survey coverage. Coverage of the DTM will be extended to include also the European coastal zones as well as the European Arctic region and Barentz sea. Furthermore, higher resolution DTM will be developed and made available where underlying data are available and released for publication by its owners. Bathymetry is the information that describes the topography of the seabed, as depth from the sea surface to the seafloor. It is an essential component in understanding the dynamics of the marine environment. Safe ocean navigation relies on accurate bathymetry data, which are also essential for planning marine installations and infrastructure such as wind turbines, coastal defences, oil platforms and pipelines. 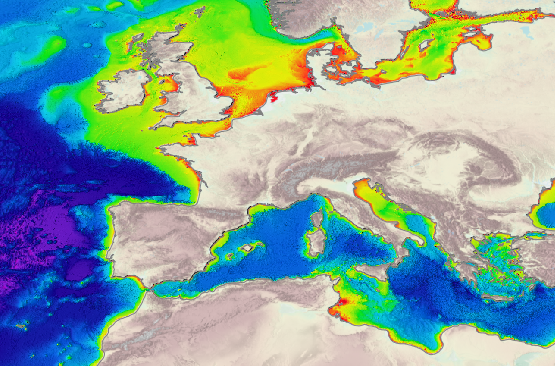 Bathymetry forms the foundation of any comprehensive marine dataset; without it, the picture is incomplete. Bathymetry Viewing and Download service: provides functionality to view, browse and download digital bathymetry as DTM and obtain information about the underlying data sets used to compile the DTM. Include in the portal a metadata data discovery and access service, by adopting the SeaDataNet CDI metadata standard, for providing clear information about the survey data used for the DTM, their access restrictions and distributors, and featuring online shopping request and delivery; this ensures that the bathymetry data sets can also be queried at the SeaDataNet portal. Include in the portal an additional catalogue service, by adopting the SeaDataNet Sextant Catalogue service, for providing metadata on composite DTMs that are contributed by a number of data providers next to or instead of bathymetric survey data. The partners of EMODnet Bathymetry combine expertise and experiences of collecting, processing, and managing bathymetric data, together with expertise in distributed data infrastructure development and operation and providing of discovery, access and viewing services according to INSPIRE implementation rules and international standards (ISO, OGC). For the purpose of collecting hydrographic data sets, such as multibeam surveys from scientific cruises, several types of hydrographic data providers were engaged. Digital Terrain Model are based on 3 types of bathymetric data sources. Bathymetric surveys, such as single and multibeam surveys, echosoundings and even historic leadline soundings. These data sets are most preferred as data sources because of their high resolution. Composite data sets, giving a gridded bathymetry, provided by Hydrographic Offices (HO’s) from the Digital Terrain Models that they maintain themselves for producing and maintaining their nautical charts following international IHO procedures. Satellite-derived Bathymetry (SDB) data will be utilised to cover gaps.